The nine-month deadline for US-sponsored peace talks between Israel and the Palestinian Authority has passed with nothing to show for the period of intense American diplomacy, as the US secretary of state, John Kerry, apologised for declaring that Israel risked becoming an "apartheid state". The two sides were possibly further apart on Tuesday than when talks were launched last July – negotiations which Kerry had hoped initially would lead to a settlement of Israel-Palestine conflict by the middle of this year. Commission in Washington on Friday, and revealed by the Daily Beast website on Sunday. In a statement issued by the state department, Kerry said: "If I could rewind the tape, I would have chosen a different word to describe my firm belief that the only way in the long term to have a Jewish state and two nations and two peoples living side by side in peace and security is through a two-state solution." Officials predicted that the end of the talks would prompt the US to withdraw from efforts to mediate, as both sides attempted to "minimise damage". "Kerry has other pressing issues he needs to deal with, including the Ukraine," said one Israeli official. "I would not expect to see any diplomatic movement for months." The deadline for peace talks passed as some ministers in Netanyahu's rightwing government called for Israel to set its own borders and annex areas of the West Bank under full Israeli control. The economy minister, Naftali Bennett, said: "We will be gradually attempting to apply Israeli law on Israeli-controlled areas." The chief Palestinian negotiator, Saeb Erekat, accused Israel of "never giving the negotiations a chance to succeed" and "used every possible tool in order to consolidate its apartheid regime". In a statement issued by the PLO, Erekat said: "Everything Israel did during the past nine months [was] aimed at sabotaging Palestinian and international efforts to achieve the two-state solution. To build settlements in occupied land, kill Palestinians and demolish hundreds of Palestinian homes is certainly not the behaviour of a government that wants to end occupation but of a government that wants to turn occupation into annexation." It was Kerry's statement, however, which was a metaphor for a US diplomatic effort that has been imploding in slow-motion for weeks. In the midst of a renewed trading of blame, only Kerry appeared to have anything he regretted. Some critics had accused Kerry and the US of becoming a party to negotiations, rather than guiding them. But in his statement Kerry hit back at what he described against "partisan political" attacks against him, while stating in retrospect that he would have chosen a different word. Kerry said his remarks were only an expression of his firm belief that a two-state resolution is the only viable way to end the long-running conflict and insisted on his history of support for Israel over the past 30 years. 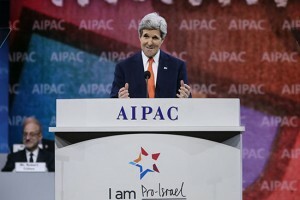 "I will not allow my commitment to Israel to be questioned by anyone, particularly for partisan, political purposes, so I want to be crystal clear about what I believe and what I don't believe," Kerry said after members of Congress and pro-Israel groups criticised him, with some demanding his resignation or at least an apology. "First, Israel is a vibrant democracy and I do not believe, nor have I ever stated, publicly or privately, that Israel is an apartheid state or that it intends to become one," he said. While few analysts believe that a third Intifada is likely for now, tensions seem set to increase in other ways . On the Palestinian side, at least, the next moves are mapped out including seeking recognition at a further group of international bodies, and pushing efforts for a national unity government supported by Hamas within a month or so followed by elections. The composition of that government, and the degree of Hamas's involvement, will define any potential conflict with western governments and their financial support for the Palestinian Authority, not least because Hamas does not recognise the right of Israel to exist. For its part Israel has already threatened the PA with punitive sanctions that are likely to be widened. One target that has been mooted is the tax and customs revenues that Israel collects on the authority's behalf. Because the PA owes Israel money for electricity supply, that amount may be deducted. 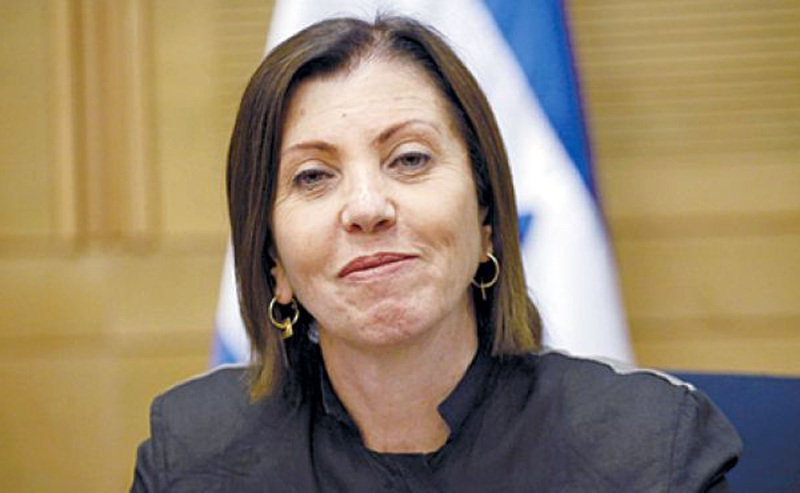 Gal-on: Netanyahu Government "Not Interested In Peace"
Leader of the Israeli Meretz Party, Zahava Gal-on, said Sunday that the current Israeli government of Prime Minister Benjamin Netanyahu is not interested in peace. Furthermore, Yitzhak Herzog of the Labour Party challenged Netanyahu to "initiate a comprehensive and courageous offer" to Palestinian President Mahmoud Abbas. According to the Middle East Monitor, a post on his Facebook page stated: "The situation is volatile and very sensitive and we must not take irreversible and potentially harmful steps." 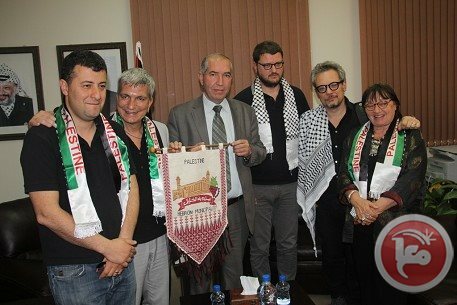 Gal-on also called on the current Israeli government to release the fourth batch of the Palestinian prisoners, as previously agreed, and to freeze settlement construction. 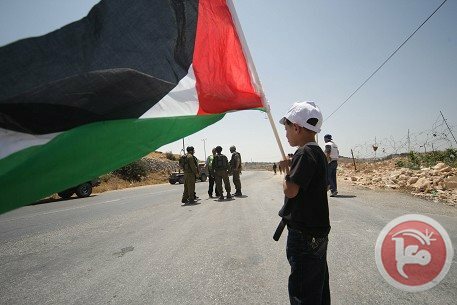 In a report about the Palestinian detainees held by Israel, the Palestinian Ministry Of Detainees said that more than 800,000 Palestinians, including children, have been kidnapped and imprisoned by Israel since 1967, while at least 5,000 Palestinians are currently held by Israel. 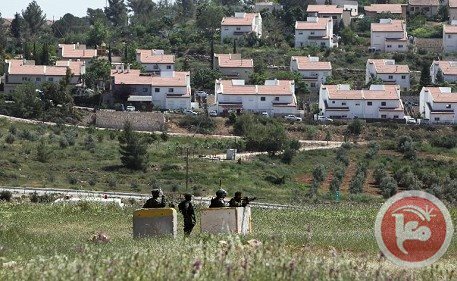 Plans for nearly 14,000 new settler homes were approved by the Israeli government, during the nine months of peace talks with the Palestinians, according to an Israeli NGO -- this in addition to over 500 Palestinian structures that were demolished throughout the US-brokered "peace negotiations". “I believe we can replace the coalition of Netanyahu, Bennett, Liberman and Lapid: the modern variation of the four sons – wicked, wicked, wicked and the one who does not know how to quit,” Gal-on recently confided to a gathering of Meretz’s youth movement. Washington called for "a holding period" in the Middle East peace process after a deadline for reaching a deal expired with hopes dashed and Israel and the Palestinians bitterly divided. US Secretary of State John Kerry has no regrets about the energy he poured into his failed Middle East peace bid and is ready to dive back in again if asked, US officials said. As the final date for the nine-month negotiation period came and went on Tuesday, peace hopes appeared more remote than ever with Israeli Prime Minister Benjamin Netanyahu and Palestinian president Mahmud Abbas locked in a tactical game of finger-pointing, and US attempts to broker an extension in tatters. After more than a year of intensive shuttle diplomacy by Kerry, Washington was reluctant to admit failure, acknowledging only a "pause" in the dialogue. "The original negotiating period was set to run until April 29th, today. There's nothing special about that date now," State Department spokeswoman Jen Psaki told reporters in Washington. But Kerry has "no regrets about the time he spent investing in this process". "We've reached a point... where a pause is necessary... a holding period, where parties will figure out what they want to do next," Psaki said. The Israeli and Palestinian leaders were quick to say they were open to resuming talks -- but only under certain conditions likely to be unacceptable to the other side. "If we want to extend the negotiations there has to be a release of prisoners ... a settlement freeze, and a discussion of maps and borders for three months, during which there must be a complete halt to settlement activity," Abbas said. But a senior Israeli government official said there would be no further talks unless Abbas renounced a reconciliation pact signed last week with Gaza's Islamist Hamas rulers. Analysts said the end of the negotiating period meant the situation would simply go back to square one. "We?re back to where we started," said Jonathan Spyer, senior researcher at the Global Research in International Affairs Centre near Tel Aviv. The Palestinians, he said, were likely to continue with their "strategy of political warfare" by seeking global recognition for their promised state, in a bid "to isolate Israel in international bodies and pressure it into making concessions". Israel, Spyer said, was unlikely to make any sweeping gestures but merely seek to maintain the status quo by seeking to either "ignore, or reverse" the Palestinian diplomatic moves. Other Israeli analysts said the collapse of the talks was a direct result of Israel's relentless settlement construction on land which was the subject of negotiations. Figures published on Tuesday by settlement watchdog Peace Now showed that in parallel with the negotiations, the Israeli government approved plans for nearly 14,000 new settler homes, describing it as an "unprecedented number". Meanwhile a mosque was among several Palestinian structures destroyed by the Israeli army Tuesday in a West Bank village for having been built without permits, concurring sources said. As the curtain fell on the talks, Kerry found himself at the centre of a storm after reportedly saying that if Israel didn't seize the opportunity to make peace soon, it risked becoming an "apartheid state" with second-class citizens. 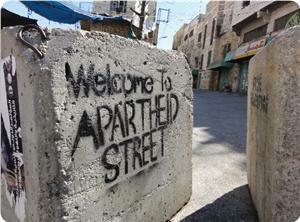 "Apartheid" refers to South Africa's 1948-1994 oppressive and racially segregated social system. In an apology issued overnight, Kerry said he had never called Israel "an apartheid state" but he did not deny using the term, suggesting only that he used a poor choice of words. Chief Palestinian negotiator Saeb Erakat accused Netanyahu's government of using the talks as a cover to entrench its hold on the territories. "Rather than using nine months to achieve a two-state solution, the government of Prime Minister Netanyahu has used every possible tool in order to consolidate its apartheid regime," he said. In a apparent shift in the US policy, Psaki appeared to suggest that Washington may be prepared to accept a reconciliation government providing it stood by principles such as non-violence and recognising the state of Israel. "If the unity government accepts certain principles, then it hasn't been our position to oppose that," Psaki said. But she stressed: "They haven't indicated a desire to abide by the principles -- Hamas, that is." However US lawmakers and officials warned Tuesday that Palestinian leaders risk forfeiting millions of dollars in US aid if they press ahead with plans to form a unity government including militant Hamas members. "Let me be utterly clear about our policy towards Hamas," Assistant Secretary for the Near East Anne Patterson told a House hearing. 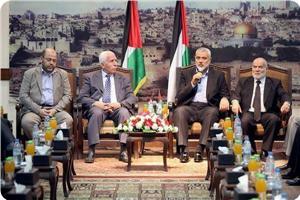 "No US governmental money will go into any government that includes Hamas until Hamas accepts the Quartet conditions. And that's renouncing violence, recognizing previous agreements and most explicitly recognizing Israel's right to exist." Saeb Erekat is chief Palestinian negotiator for the PLO. 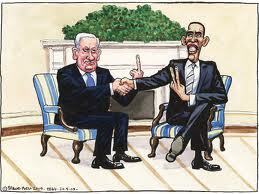 During nine months of negotiations, Israeli officials have constantly questioned our ability to make peace. World leaders visiting Tel Aviv have been faced with rhetorical questions like "Shall we make peace with Gaza or the West Bank?" or statements like "Mahmoud Abbas does not represent all Palestinians." Last week, after we announced our national reconciliation agreement, Israel contradicted its own argument: suddenly peace was impossible due to Palestinian unity. During the early 1980s, Israel's excuse was the Palestinian Liberation Organization's refusal to recognize Israel. In 1988, we recognized Israel on 78 percent of historical Palestine, a deeply difficult and historic concession. Twenty-six years later, the number of Israeli settlers within the remaining 22 percent has tripled. Next, Israel's excuse was lack of Arab recognition. In 2002, the Arab League introduced the Arab Peace Initiative, offering recognition from 57 Arab- and Muslim-majority countries in exchange for Israel's respect for UN resolutions. Israel's response? More settlements. Most recently, the Israeli government came up with a further qualification -- that we should recognize Israel as a Jewish state, safe in the knowledge that this could not be accepted. Rather than being afraid of not being recognized, it seems Israel is afraid of recognition. Today, Netanyahu and those representing him, including Lapid, Yaalon, Lieberman, Bennett and Ariel, are creating a new excuse to avoid the necessary decisions for peace. This Israeli government, which continues its settlement activities all over Palestine, is trying to blame national reconciliation for its own failure to choose peace over apartheid. First and foremost, reconciliation is an internal affair. Not a single party in Netanyahu's government has recognized Palestine. Nor have we asked them to. Political parties do not recognize states. Governments do. Secondly, reconciliation and negotiations are not mutually exclusive. Reconciliation is a mandatory step in order to reach a just and lasting peace. The agreement ratifies the PLO's legitimacy to negotiate with Israel, honors all Palestinian commitments and obligations towards international law and previous agreements and calls for the formation of a national consensus government comprising independent professionals. This government is not going to negotiate with Israel: its sole mandate will be to prepare for elections, provide services and build institutions. Palestinian reconciliation can be rejected only by those who aim to perpetuate the status quo. This is precisely what the government of Israel has been doing during nine months of negotiations: killing 61 Palestinians, advancing more than 13,000 units in Israeli settlements, conducting almost 4,500 military operations on Palestinian land, demolishing 196 Palestinian homes and allowing more than 660 settler terror attacks against Palestinians. Being consistent with its policies on the ground, Netanyahu's government has refused to recognize the 1967 border or even put a map on the table proposing Israel's idea of its final borders. Netanyahu has ensured that he is unable to do this by surrounding himself with the most extremist sectors in Israel, including the settler movement, from which he selected his foreign minister, housing minister and the Knesset speaker. In fact, 28 out of 68 members of his government reject the two-state solution entirely, while others "accept it with reservations," meaning something very different to two states as stipulated under international law. Israel's claim that negotiations have been halted due to Palestinian reconciliation is completely disingenuous. Frankly, it is difficult to understand how anyone could expect us to negotiate with such a government. And yet we have, in good faith, offering concession after concession for the sake of peace. Once again, we have held up our end of the bargain. Once again, the Israeli government has not. The truth is simple: Israel refuses to negotiate sincerely because, as long as the status quo is so beneficial to it, Israel has no interest in a solution. Without firm signals from the international community, Netanyahu's occupation and colonization policies are incentivized. With Palestine's new international status, we will continue shaping our country as a peace-loving nation that respects human rights and international law, a commitment already assumed during the announcement of national reconciliation. This includes our right to make use of international forums in order to end Israeli violations and achieve the fulfillment of our long overdue rights. Meanwhile, the ruling coalition of Israel should stop wasting its energy on excuses and start realizing that apartheid is not a sustainable option. Israel's rejection of Palestinian national unity has little to do with Hamas and a lot to do with its own unwillingness to do what is needed for a just and lasting peace. Op-ed originally published in Time Magazine on April 29. Washington's deadline for reaching a Mideast peace deal arrived Tuesday with no breakthrough and US Secretary of State John Kerry mired in a row over allegations that he said Israel risks becoming an "apartheid state." After more than a year of intensive shuttle diplomacy by Kerry, with the initial aim of brokering a deal by April 29, Washington's patience appeared to be growing thin as both Israel and the Palestinians moved to distance themselves from the crisis-hit talks. Kerry on Monday vehemently denied calling Israel an apartheid state, as a furor grew in Israel over comments the top US diplomat reportedly made during a private meeting. "I do not believe, not have I ever stated, publicly or privately that Israel is an apartheid state or that it intends to become one," Kerry said in a strong statement after calls for him to resign or at least apologize for the alleged comments, which appeared on US online news site The Daily Beast. But Kerry, who has seen his dogged efforts to broker peace between Israel and the Palestinians collapse, did suggest that he had used a poor choice of words during his speech Friday to international political experts at the Trilateral Commission. 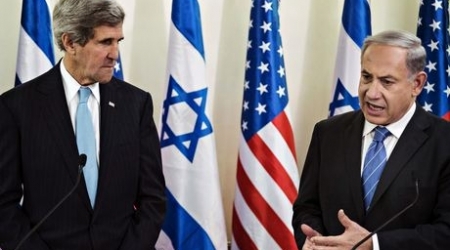 Kerry insisted that although the peace process was at a point of "confrontation and hiatus," it was not dead -- yet. But both the Palestinians and the Israelis appear to have drawn their own conclusions about the life expectancy of the US-led negotiations, which have made no visible progress since they began nine months ago. Last week, Palestinian leaders in the West Bank and the Hamas-run Gaza Strip announced a surprise unity deal aimed at ending years of occasionally violent rivalry. Israel denounced the deal as a death blow to peace hopes and said it would not negotiate with any government backed by Hamas, the Islamist movement whose charter calls for the destruction of Israel. Washington called the deal "unhelpful." Under the agreement, the PLO and Hamas will work to establish a new unity government of political independents headed by president Mahmoud Abbas, whose Fatah party dominates the PLO. Abbas has said the new government will recognize Israel, as well as renouncing violence and abiding by existing agreements, in line with key principles set out by the Mideast peacemaking Quartet. But Netanyahu has ruled out any negotiation with the new government unless Hamas gives up its vision of destroying Israel. Kerry, speaking at a closed-door meeting of international experts, reportedly said that if Israel didn't seize the opportunity to make peace soon, it risked becoming an "apartheid state" with second-class citizens. The Daily Beast website said it had been given a recording of Kerry's speech, which led one Republican senator to call for his resignation. Kerry should offer his resignation and President Barack Obama should accept it, Cruz added, "before any more harm is done to our national security interests and our critical alliance with the state of Israel." Israeli Transport Minister Israel Katz, a member of Prime Minister Benjamin Netanyahu's rightwing Likud party, expressed outrage at Kerry's reported comments. "Kerry, shame on you. There are some words you cannot use," he wrote on his Facebook page. "On this day of national commemoration of the Holocaust, we have the US secretary of state describing us as an apartheid state -- us, the state which is subjected to threats of destruction." 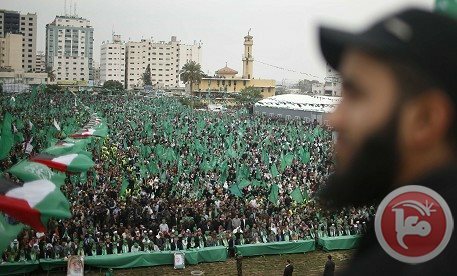 Meanwhile, in remarks in Gaza on Monday, Mussa Abu Marzuk, a Cairo-based top Hamas leader, reaffirmed that the unity government would "not be political." He said its mandate would be primarily to prepare for elections within six months, restructuring the security services, and overseeing the reconstruction of the battered Gaza Strip. Tzahi Hanegbi, an MP close to Netanyahu, told army radio that Israel should "wait to understand the meaning" of the Palestinian unity deal. "Israel must act intelligently and with restraint, and not play into the Palestinians' hands by helping them out of the trap into which they have fallen," he said. Israel and Washington are reportedly at odds over the proposed new Palestinian government, with US officials waiting to see whether it will embrace the Quartet's principles.